Founded in 1989, Animal Place’s California animal shelters fills a much-needed niche of farm animal rescue, sanctuary, education and adoption. Animal Place is one of the largest and oldest animal sanctuaries in the nation. We operate a 600-acre sanctuary in Grass Valley, California. Animal Place extends compassion to all life with a special emphasis on farmed animals. This is executed by providing permanent sanctuary, education, legislation and appropriate placement of needy animals. Animal Place’s permanent shelter is a northern California tourist destination spot – nestled between Sacramento and Lake Tahoe, our 600-acre Grass Valley farm animal shelter is a testament to the beauty of the Sierra Foothills. Visitors are invited to tour the sanctuary on self-guided and guided farm tours. 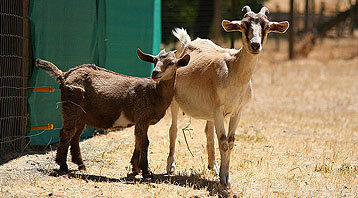 The 300 animals at our refuge are permanent residents. See photographs of rescued animals! In addition to providing sanctuary farmed animals, Animal Place serves as an education and advocacy center. We offer tours, cooking classes and workshops at the sanctuary as well as volunteer and internship opportunities. Because factory farming takes the lives of 10 billion land animals each year in the United States, we promote a vegan, cruelty-free lifestyle. If you are ever in the area, we hope you can sign up for one of our tours and meet the wonderful residents at Animal Place. 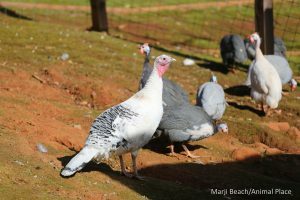 Animal Place’s new Rescue and Adoption Center in Petaluma is focused on placing needy farmed animals into permanent homes. The Rescue and Adoption Center will allow us to perform large scale rescues, and save thousands of lives a year. 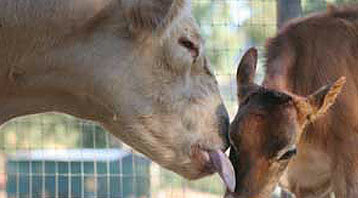 The work we do in Petaluma, will be a continuation of our adoption program previously known as Rescue Ranch. The grand opening of our Rescue and Adoption Center is June 29th, 2019.